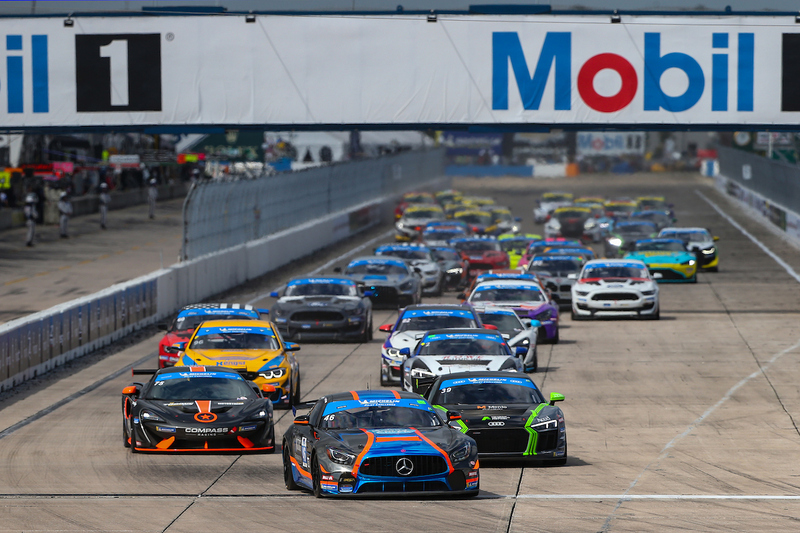 The second round of the IMSA MICHELIN Pilot Challenge is in the books, with the Alan Jay Automotive Network 120 complete at Sebring International Raceway. 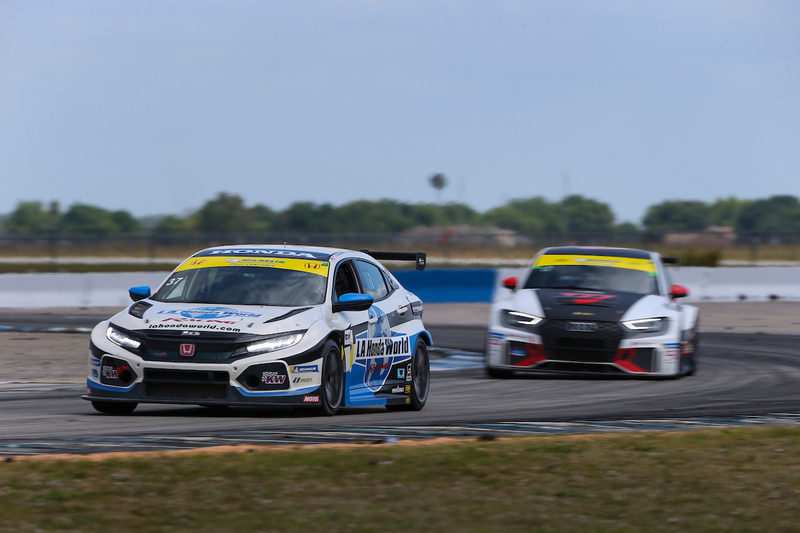 Both GS and TCR set qualifying and race lap records by a considerable margin over 2018. Five different automotive brands (Audi, BMW, McLaren, Mercedes-AMG and Ford) finished in the top five. Tyler McQuarrie and Jeff Westphal’s first win for the Carbahn Motorsports Audi team followed several near-misses in 2018. The team finished fifth in GS points with five top-five finishes, and a third place in Monterey their best result. This result moved them into third place in the GS points standings. Bimmerworld BMW also finished in the top-five for a second straight race, and is tied with MIA McLaren for the GS points lead. It was a clean drive from Devin Jones and James Clay to finish second in the No. 82 BMW M4 GT4, after ending fourth in Daytona. After tough Daytona races where they finished 29th and 27th, respectively, the No. 35 Riley Mercedes and No. 60 KohR Ford completed the top five. KohR’s pair of Kyle Marcelli and Nate Stacy entered the race in search of their third Sebring win in 12 months. KohR finished strongly with all three of its Mustang GT4s. Rod Randall and Kenny Wilden finished sixth, and the team’s new third car of DJ Randall and Mustang veteran Alec Udell ended 11th. The two Multimatic Mustangs that featured a quartet of NASCAR Truck drivers ended 15th and 25th. Polesitter Owen Trinkler’s No. 46 Team TGM Mercedes, a car he shared with Hugh Plumb, got tapped late in the race by another car and fell to an unrepresentative 13th. This was one spot ahead of the second TGM car, driven by Ted Giovanis and Guy Cosmo. While Porsche had a banner weekend in WeatherTech and FIA WEC competition, its best car in the MICHELIN Pilot Challenge ended 17th. Daytona winners Compass Racing also ran into issues and ended 23rd. Honda led most of the race with either the winning No. 37 L.A. Honda World or No. 84 Atlanta SpeedWerks Civic Type Rs. Tom O’Gorman and Shelby Blackstock are off to the perfect start to the year, with a pair of wins in Florida. As in Daytona, two Hondas finished on the podium. This time it was HART’s No. 89 car of Ryan Eversley and Chad Gilsinger putting in a solid, scrappy drive to third place for their first podium of the year. JDC-Miller Motorsports’ second car of Mikey Taylor and Britt Casey Jr. impressed in its first start of the year. Casey took the pole and led early before they finished second. The pair of Bryan Herta Autosport Hyundai Veloster N TCRs had a solid day, with fourth and sixth place finishes. This is an improvement from fifth and ninth in Daytona. Alfa Romeo’s top car ended ninth in Sebring, after a best result of eighth in Daytona.